Tamburlaine was also known as Timur and Tamerlane. Watch a video about Tamburlaine and the Timurid Empire. Read a brief introduction to Tamburlaine's life. Find out more about the Mongol Empire, and the city of Herat that was destroyed by the Mongols. Animated map of the growth of the Mongol Empire. See pictures of the tents, called kibitkis (or gers or yurts in other regions). More about the nomadic lifestyle. Watch a video about the ancient city of Samarkand and Tamburlaine. Find out more about the city of Samarkand, which is now in Uzbekistan. More pictures of Samarkand today. Books, paintings and ceramics from the time of Tamburlaine. Tamburlaine the Great is a powerful, brutal ruler. His sights are set on Delhi, City of Gems, and Rusti, one of his young warriors, rides out into the flames of battle for his first taste of war. A tale of friendship, destiny and revenge set in the war-ravaged lands of fourteenth-century India. Nominated for the CILIP Carnegie Medal 2009 and shortlisted for the UKLA Children's Book Award. RUSTI is a Mongol warrior, fighting for the bloodthirsty Tamburlaine, Conqueror of the World. He intends to show the enemy neither fear nor mercy... until he comes face-to-face with his first elephant. KAVI is the elephant's rider. Captured by the terrifying Mongol Horde, he fears for his life. But the boy who takes him prisoner does not kill him. And soon it seems they might almost become ... friends. Then Rusti uncovers a terrible secret, and the unlikeliest of friendships is put to the ultimate test. Geraldine lives in Berkshire with her husband John and the lingering shades of all those characters she has invented in her books. Her cottage is under year-round siege from wild birds demanding to be fed. The ducks even knock on the door. 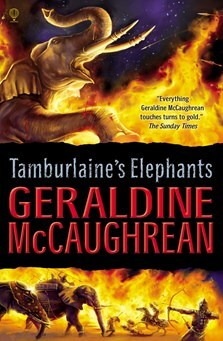 Visit the author’s website, www.geraldinemccaughrean.co.uk, for more information. Whatever the period and characters this author writes about, and they have been many and various, she always conveys the effect of total credibility achieved by her mysterious ability to get into the minds of whoever she is describing. Often funny despite its grim location, this story of moral change linked to hectic action is truly memorable, beautifully written and unreservedly recommended. Everything Geraldine McCaughrean touches turns to gold. After her triumphant sequel to Peter Pan, she has returned to writing in her own voice, on top form...This is a story full of irony - and subtlety beyond its apparent simplicity - about a friendship between enemies, about innocence lost, about old secrets and revenge, and about the real meaning of war. This is a breathtaking tale. Effortlessly, convincingly the author explores the customs, the language and the fabric of the period so that we almost become a part of the unfolding action. Geraldine McCaughrean is an awe-inspiring writer with a miraculous talent for bringing to life past times and faraway lands. Geraldine McCaughrean's gift for memorable descriptive language is strongly present in this latest work, alongside plenty of humour and a gripping plot. Strongly recommended. The account is wholly convincing, the detail superbly observed...Grippingly atmospheric history and a marvellous read. This is another amazing book from Geraldine McCaughrean whose writing covers a fantastic range of times and settings but who always delights with stunning prose and wonderful stories. Geraldine McCaughrean is a genius in her ability to draw the reader in to a part of history that might not immediately spring to mind as being of interest and yet she makes you hungry for more. Here, she draws upon a violent period of India’s history and interplays that history with a wonderful friendship that develops despite horrific dangers. The characters are brilliantly drawn and the sights and smells of time and place are so well described you feel you are there, on the battlefield, on the plains and in the cities. It’s something entirely different from McCaughrean’s most recent novel, Peter Pan in Scarlet, the sequel to Peter Pan but it is equally compelling. This interestingly written book has, at times, almost an aura of myth about it. On one level, it's a tale of an unlikely friendship between two boys; on another, it's a psychological journey from unthinking warmongering to recognition that brute force entails the deaths of many innocent people and the destruction of whole cities. But it's more than this; the author is also concerned with the concomitant cultural destruction where something valuable is lost forever. The truths Rusti learns are eternal: love, truth, peace; respect for others who are different, for animals, for life. On the surface, this is an epic tale of man's inhumanity to man, but it is redeemed by the small acts of courage and kindness through which humanity shines. A most rewarding book.